What a day! After a 25 minute walk to the train stop, 20 minute ride to Leeds to switch trains, 25 minute ride from Leeds to Ilkley and then a 15 minute open air bus ride through the English countryside, we finally reached our destination: Thomas the Train Heaven. It was Thomas everything! There were about a million small children that were totally in love with Thomas. Of course we had to join in the fun! The Embsay and Bolton Abbey Steam Railway put on the Day Out With Thomas three times a year. It was really neat, just took forever to get there. Here is the antique bus that was chartered just for this event. They gave free bus rides from the train station to the Thomas event. Thomas bounce house! Caroline and Tucker both loved it and laughed the entire time they were in it! Caroline on the recycled toy ride. Her favorite was the pink (faded red) car. The green train was just Tucker's size. 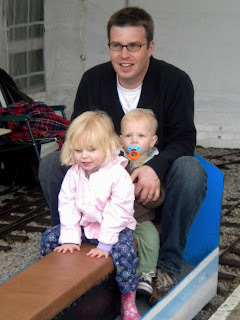 We rode the antique trains from one station to another. This was our view for most of the 15 minute ride. Sheep, sheep and more sheep. Caroline and her new boyfriend, Joshua. They instantly took to each other and played and danced while on the train. They even held hands...it was so cute! Once we got off the train, Joshua got on this ride. Caroline was right behind him! She jumped right up without even hesitating. Thomas the Train ... need I say more?!?! Caroline got a turn tootin' Thomas' horn. She also learned about the coal and the steam engine. Well, she knows that it is HOT, and that may be about it. Here is the old train station at Embsay where we "met" Thomas. Back on the train ... brother and sister checking out the sheep. We got back on the bus to head home and Caroline spotted some potential friends. Their Mum was reading to them and Caroline got right in the middle.